Alice Oseman’s story is about two worlds that collide, it is about what happens when fans meet the band members that they’ve been obsessed with for years. ‘The Ark’ give Angel’s life meaning, hope and her closest friend- fellow Ark fan Juliet. The lives of Jimmy, Rowan and Lister have also increasingly revolved around ‘The Ark’ as the band members are increasingly confined to a life of music tours and interviews, unable to find time for themselves and their friends and family. This is a story where walls are broken, and the people on the two sides of the wall see each other for what they are- flawed, human and ultimately kind. 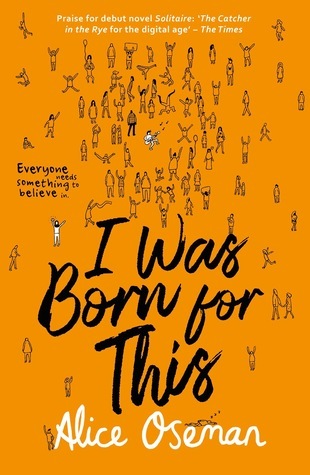 I Was Born For This is a heart-warming coming-of-age story with an important message. It is uplifting tale about kindness and friendship being discovered in the most unexpected situations and places- on the Internet, in the toilets of a concert hall- and how such friendships enable characters to overcome their problems. Fame and fandom play a large role in this story, as Oseman narrates both sides of the story, and she definitely has a refreshing take and powerful message on this topic. Her characters are very diverse, which I believe is excellent, given how important this is to people of various underrepresented groups. Furthermore, the diversity of her characters does not feel artificial, it simply adds another layer to the characters’ lives. I like how sensitively Oseman has written these characters and attended to minor details of their identities to make the novel more realistic. What is God was one of us? This song, featured on Oseman’s playlist for this novel, captures one of the key themes of the novel- what if our pop idols were human? The main characters, Angel and Jimmy, are well-developed and more importantly, feel human. And this I believe, is one of the most important messages of the book- that both fans and idols are human. Oseman succeeds in humanising elusive and worshipped band members, showing that they too struggle with mental health, relationships, unfair music contracts. I think the depiction of anxiety is particularly well-written and realistically reproduced, as someone who has anxiety themself. On the other hand, fans are depicted in a wide-ranging and largely sympathetic way- Oseman doesn’t shy away from acknowledging that, yes, “crazy” fans might exist, but most fans are relatively harmless, just teenagers trying to negotiate their identities, relationships and life paths. It was a good, sweet book. The goodness in the world, the hope and love, the main character Angel is searching for throughout the book, seems to be contained within this book and its positive message. However, the novel was not perfect. There wasn’t much about the prose that stood out, although I liked the little flourishes and dramatic quotes from Joan of Arc at the beginning of each chapter. Although it was definitely refreshing to see Oseman write about a new topic and type of character (not just focusing on university and school students), I also felt that the structure of this novel was still very similar to that of her two previous novels. However, what I believe was a more important problems is that I felt that many of the supporting characters were not fleshed out enough or well-rounded. Furthermore, I felt like the plot was not given enough depth or length either, and I felt like I wanted to know more, but was not given it. Although Oseman was able to communicate the message of the novel very effectively without going into as many details as I would have liked. And I acknowledge that many people will enjoy the novel without wanting more details and further exploration as I do. Another problem is that many parts of the plot seemed overly dramatic and a few incidents in the novel appeared unrealistic. Lastly, the main characters are supposed to be the same age as me, but many of the characters felt a lot younger. Perhaps I am getting old. Perhaps I am just becoming more cynical and mature at Cambridge. So just ignore me on that. I’m sure most readers are slightly younger than me or can identify better with the characters. Overall this is a diverse and uplifting book. I would recommend it to people interested in diverse reads, the topics of fandom, fame and friendship, and learning more about mental health problems. Important: CN: anxiety, descriptions of panic attacks, mentions of being publicly outed in the past. Disclaimer: I was given an ARC copy of this novel in exchange for a fair review.